I decided to try my hand at it, so I looked for a few authors who I appreciate that weren’t yet represented with such a daily quotes page, and I settled on Paul Tournier and Lowell Bennion (follow them at @BennionLowell and @paul_tournier). Paul Tournier is not well known today. In fact, when I tried to find ebook versions of his on Amazon, there were none. Luckily, the University of Washington library system has a few of his works in circulation that I was able to snag. I first encountered Tournier on a Christian blog. The author had cited Tournier as an example of a man who truly embodied his faith: he practiced what he preached. I wanted to read something more of this example of authenticity, so I began with his book The Meaning of Persons. Tournier had a unique perspective. As a Swiss doctor, he mixed in man examples and terminology from his field. And he was also a Freudian, but I would say this book begins to transcend some of the limits of Freud. Like Lewis, Tournier goes beyond the limits of denominational concerns, illuminating the path of a disciple of Christ. 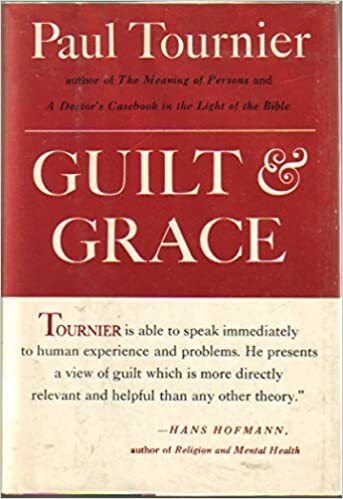 This most recent book of Tournier’s on my reading list, Guilt and Grace deals with the perhaps seeming unpleasant topic of the role of guilt. Those who become disillusioned with religion perhaps attribute part of it to an overburdening guilt. Churches are just there to blackmail you with guilt into obedience. Tournier shares Nietzsche’s criticism of moralistic Christianity: the hardening of the gospel of Christ into nothing more than lifeless taboos: this is exactly what Christ was opposed to. But he also admits the inevitability of this process in history: leaders like St. Augustine, St. Francis of Assisi, and Martin Luther all rediscovered the grace of Christ, but those who followed them quickly codified it back into moralistic blackmail. This has profound theological implications: do we hinder another’s spiritual progression in our supposed attempts at “rescuing” them of reminding them of what they are doing wrong? Once again, I admire the profundity of Tournier’s model of Christian love. It leaves me feeling wanting to do better.